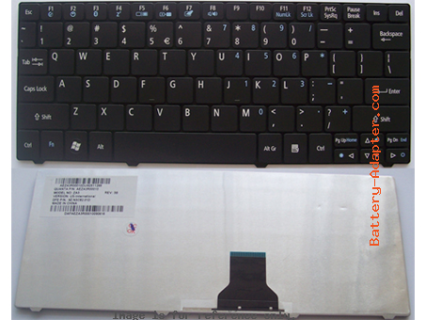 This gudie applies to Acer Aspire 1410 (11.6"), Aspire 1810seires, Aspire 3935 series, Aspire one 751h series (AO751h series). In this case, the real laptop is 11.6" Aspire 1410. Note: Acer Aspire 1410 have another type which is not 11.6", please refer to another guide How to Replace Acer Aspire 1410 / 1680 Keyboard. 1. Turn off your 1aptop, disconnect the AC adapter and remove the battery. Open the laptop. 2. Using the plastic pry, press in the four latches along the top of the keyboard to release the keyboard from the cover. NOTE: The keyboard will spring up slightly when all retaining clips are unlocked. 3. Using the plastic pry, lift up the top edge of the keyboard and then lift the keyboard up. 4. Flip the keyboard over. 5. Reverse the procedure to install your new Acer aspire 1410/1810T or Aspire one 751h keyboard.